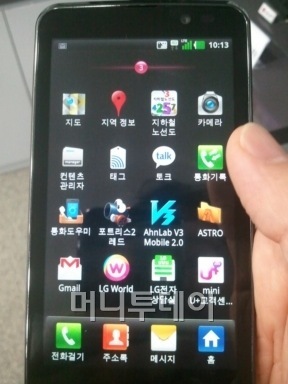 If LG's tease routine didn't whet your appetite for the LU6200, these freshly leaked pics might do the trick. Obtained by Korean site Money Today, these in-the-wild images appear to corroborate many of the specs we've already heard about, including that 4.5-inch AH-IPS display at 720p resolution, eight megapixel camera and 1.3 megapixel front-facing shooter. This device is also rumored to feature a 1.5GHz dual-core CPU, 1GB of RAM, 4GB of built-in storage and will reportedly ship with Android 2.3.5, though it'll be ready to update to the forthcoming Ice Cream Sandwich, as well. The LU6200 is expected to hit the Korean market sometime next month, where it'll run on LG Telecom's U+ LTE network, but you can check out an extra image of its commodious display after the break.